IYES debut single proper is a corker. From the opening drums and hand claps (How long before live performances string out the intro and get the audience to the claps like Queen’s We Will Rock You?) through to Melis “Mmm-Hmm” at 2.10 it doesn’t put a foot wrong. In a complete change mood, Coconut Hair, from The Beautiful Word’s new release Particles is silly and nonsensical and will put a smile on your face. Kins new single starts off sounding almost jazzy, but soon settles into beautiful abstract guitar pop which feels familiar yet unlike anything you can put your finger on. We haven’t heard much from Plasticine since we first crossed paths with them back at Sea Monsters back in January. After nearly a year they’re back on the blog with a fantastic pop single. Faux Flux follow up this year’s earlier Come Alive release with new single Week Long War, which we like even more. We’ve posted the video here, but you can download the track and it’s b-side for free over on their bandcamp site. Bentcousin’s first proper release since their Everbody’s Got One EP is a track quietly tucked away on a compilation album. While it starts off with gentle guitar lines that echo I Think I Like You Girlfriend More Than You from their debut, the subject matter is much more hard hitting. Bentcousin are playing an unplugged gig at Revenge on Sunday afternoon at 4pm for World Aids Day. Here’s another post of new music that has come to our attention. We literally can’t keep up – we started writing this about a week ago, but every day there’s been new things to add to it. Good work Brighton! Thew new two track Faux Flux EP is out now on Donut Records. The EP features two new tracks, the poppy Week Long War and the more ethereal As Kids. Grab the EP as a free download over on Bandcamp now. Flah Bang Band are continuing with their effort to put out a video for every track on their Bite Your Tongue album, this time filmed in an ex-DIY store. Mother is the third video from the debut EP by Tigercub, which got released on iTunes last week on Club The Mammoth records. Videos for the other two tracks – Little Rope and Centrefold – have been online for a while, but Mother has just popped up to coincide with the release. Dreamers of the Day is the debut single from Plasticine, who we first caught back at Sea Monsters earlier this year. You can grab it as a free download over on Soundcloud. Pat and Amelia from Bentcousin are only in their early twenties, so it’s more than impressive for them to be tackling a subject like domestic violence. Sunglasses in Winter appears on Creechers, a new compilation on Creech Records. You can download it for free here. The compilation also includes Fire In The Sky by Dog in the Snow, which we featured a few weeks back. A Lily is the musical project from James Vella, one of the guys responsible for Fatcat Records. Lupa is lovely stuff – lush strings, twinkling electronica and melodic vocals. As well as the bandcamp links, you can also pick it up on 12″ from Resident in town. Eden is the fourth of a set of EPs put out by Heliopause as the band goes through a bit of a transition period. Each of the tracks on the release are just vocal and guitar, gentle almost-folk, but Richard Davis – the constant member in the group – is in the process of putting together a full band for the new material he’s working on. Sometimes at this time of year, especially in the evenings, the seafront isn’t the most inviting of places but these days there’s a reason every Wednesday to head out that way. 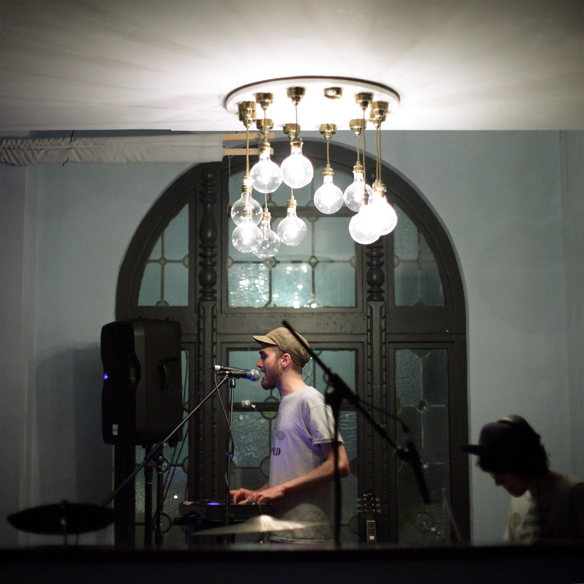 Above Audio have started holding regular live music nights, some run by the team there, some run by other promoters (we’ve been to a couple put on by Les Enfants Terribles). The main thing in common is that they’ve all had great local line ups. Last night we were treated to Momotaro and Faux Flux, two bands who’ve been on our list of acts to see for a few months now. We wrote about Faux Flux’s Come Alive EP earlier this year, and the band had been on the bill at a number of gigs we’ve been to (including most recently IYES last week at the Prince Albert) but for one reason or another hadn’t managed to catch them until last night. More fool us, because live they’re an even better prospect than in recorded form. With drumming as taut and lean as Demelza Mather’s there’s no need for a drum machine and although they’ve recently been touting for a third member to help them out with bass / keyboard duties Alex Ensoll seemed to have everything under control. 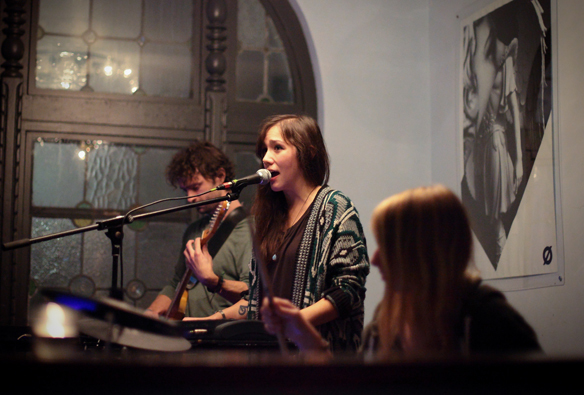 Headliners last night were Momotaro, who have been on our radar since the summer. Their electronic dub translated really well to a live setting with reverb drenched samples triggered on various keyboards and on the electronic drum kit. It’s no surprise that Audio had a decent PA which made the bottom end sound great but also left plenty of space for the r’n’b influenced vocals. Momotaro have got some great songs and a setup which not only works well, but is different enough to make a lasting impression. We came away last night thinking we might just have found our favourite new Brighton band of 2013. Just a very quick round up of this weekend’s gigs for you all, since we’re off out to see some live music tonight ourselves. On Friday night Audio celebrate their ninth birthday. That makes us feel very old indeed. There’s a big club night take place after 10pm, but a gig with local bands before then starting from seven, put on by our friends at Les Enfants Terribles, with Curxes, King Dinosaur and Alphabets Heaven playing. 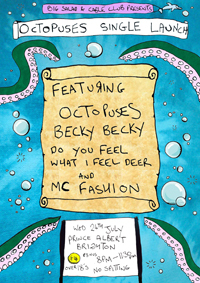 We also spotted that this week’s Brighton Rocks at Sticky Mikes with Alice Amelia, Faux Flux and Lu’Ami. 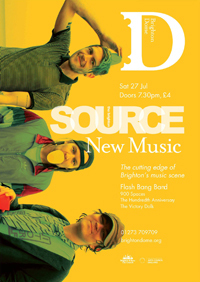 Saturday sees Brighton Music Blog favourites Bent Cousin are headlining at Prince Albert, which should be good. Elsewhere, Mok and Tiny Dragons play The Haunt, and Crayola Lectern is supporting William Drake at the Komedia. Our recommendation for Sunday night is Flash Bang Band’s album launch at the Green Door Store. 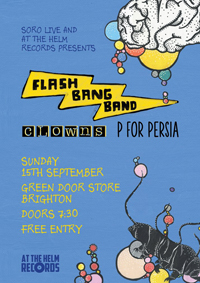 Support comes from P for Persia and Clowns – there’s three great bands to see for free. We’ll have an interview with Andy from Flash Bang Band going up very soon, so look out for that. In Brighton, the first weekend in August is associated with being Pride – probably the biggest party in the local calendar. We’re not going to include that in our weekend gig picks because of the lack of local acts on the bill, but we have got a whole load of other gigs to tell you about, including a very special couple of days at the Green Door Store. Tomorrow night IYES and Yumi & The Weather are supporting MT at the Prince Albert. It doesn’t cost anything to get in, but to get hold of a ticket you’ll need to register online. There’s quite a few gigs on Friday that have caught our eye. AMiTY and Jacko Hooper are playing at Neighbourhood on St James Street, and The Jargonaughts (featuring ex members of Los Albertos) are on at the Gladstone. Over at The Hope multimedia electronica night The Outer Church hold the launch night for their new compilation with live music from Pye Corner Radio, Kember Norton, Embla Quickbeam and Wrong Signals. Over Saturday and Sunday Green Door Store are holding an event called TwoThreeFour. 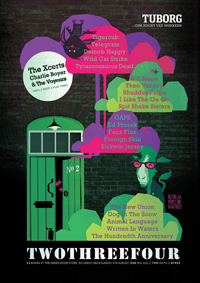 There are over twenty bands on the bill, mostly from Brighton, including The New Union, Kill Moon, Faux Flux, Spit Shake Sisters, Dog in the Snow, GAPS, Written in Waters, The Hundredth Anniversary, Tyrannosaurus Dead, Ed Prosek, Tigercub, Foreign Skin, Wildcat Strike and Demob Happy. It’s an amazing line up, and it’s free – You’d be a fool to miss it.